Based in and around SWINDON, Scott’s Potatoes offer a regular fortnightly home delivery service of quality grown potatoes, fruit, vegetables and eggs. By working closely with our growers, we can ensure only the best product is always available to the customer. The majority of our potatoes are packed in paper bags, for better shelf life. Sizes available are 2kg, 4kg, 10kg, 20kg and 25kg and are delivered straight to your door. 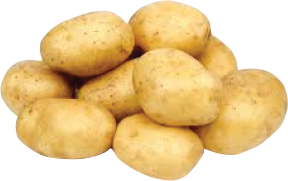 The main varieties of potato that we specialise in are: Wilja, Maris Piper and Desiree which are traditionally renowned for their cooking quality and flavour. Our Potatoes are priced competitively to challenge the supermarkets. We deliver fortnightly to Swindon and local surrounding areas. Please click on the Delivery Areas to find your Delivery Dates. All internet orders will be delivered on the Saturday. Tip – We suggest you keep potatoes in a cool, dark place. Fact- A brushed potato has a shelf life of 2-3 weeks longer than a washed potato.